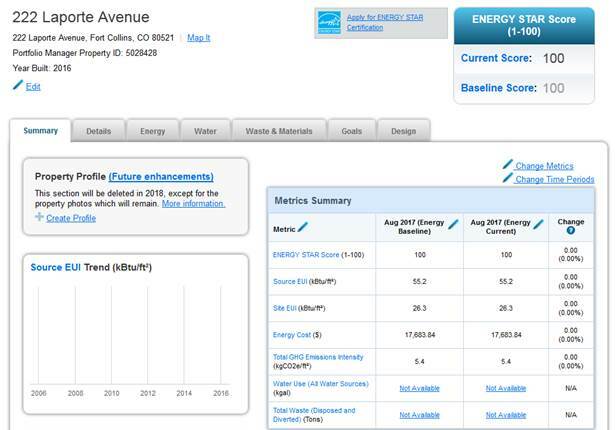 After collecting the required 12 months of real-world energy use data, the City of Fort Collins Utilities Administration Building (UAB) at 222 Laporte has received an Energy Star Score of 100! Stu Reeve, the CoFC Energy Manager, called it "Exciting news! [...] Pretty impressive for the first year of operation." The LEED Platinum building features a 100 KW rooftop solar array, extensive and careful daylighting, recycled and local materials, and a heat pump mechanical system. These systems are also engineered to tie-in with future projects as the city develops a civic campus. You can see photos and find more information at the project's page.